Despite an outsized amount of media coverage the past couple years, Nicaragua is still well off the radar of most upscale travelers. 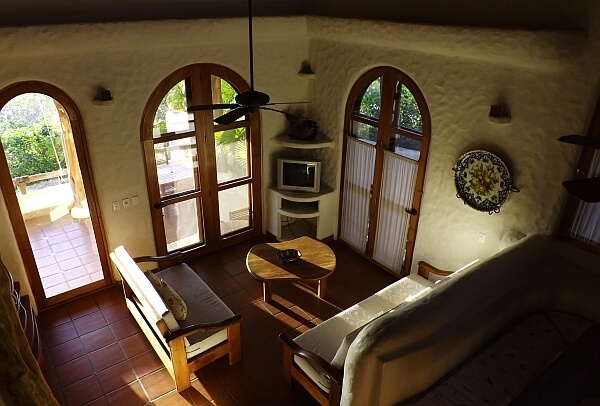 So if you’re looking for a beach splurge that won’t wreck your bank account, Pelican Eyes in San Juan del Sur will give you million dollar views for a low three-figure price. On a steep hill right above the center of town, Pelican Eyes Resort looks out on the beautiful bay, where yachts bob in the calm waters and the sunsets are glorious. You can get much rougher waves nearby if you’d like: this town was popular with surfers long before the big hotels went up. Multiple beaches in both directions are rarely crowded and some are places with legendary waves. 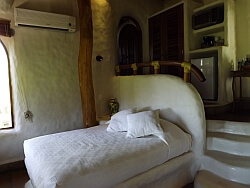 This hotel is really a collection of individual houses though, ranging from one-room casitas with microwaves and mini-fridges to villas with multiple floors that can sleep a family. This resort is not for those with limited mobility as you have to work for the views via multiple staircases or steep roads. The smaller rooms are in the oldest bottom section, near reception, a bar, one of the two restaurants, and one of three pools. These are cozy and have a nice terrace outside, plus they’re a short walk down some steps to go into town for nightlife and other dining options. They have lots of personality, having been made with hay bale and cement construction that allows lots of curving surfaces, built-in sitting areas, and wall nooks. Cheerful color schemes and plenty of foliage outside the windows make for a nice mix of nature and nurture. The TVs here are basic, but they get satellite channels and have DVD players. The complimentary Wi-fi in most units and the public areas is a big plus. Air conditioning works well when the weather gets hot and there are ceiling fans when it’s not. The three levels of larger units have more furniture, more extensive kitchen appliances and dishes, and more space to spread out. The newer section bungalows also have more of a view since they’re even higher up the mountain. That means they’re tougher to get to—either up steep stairs or by taking advantage of the included shuttle transportation—but they have access to nearby amenities. 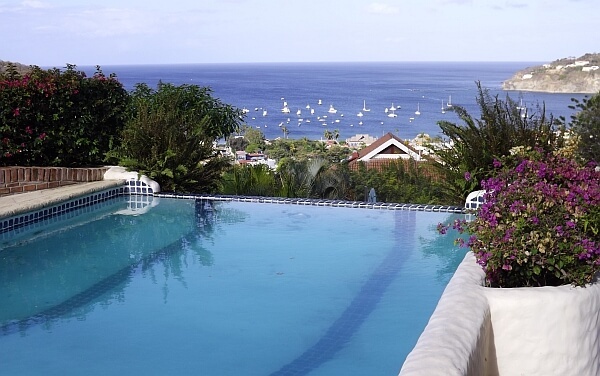 Romantic La Cascada restaurant overlooks both the large upper pool and the Pacific Ocean beyond, with reasonably priced lobster and fish fresh off the boats. They also serve Nicaraguan specialties and enticing rum cocktails. Besides the larger pool, there’s also an infinity lap pool with a great vista at the end of each lap. A small spa provides a variety of treatments, some using ingredients from the country’s rich farmland. The staff here can arrange all kinds of excursions. Some guests we met were just getting back from ziplining while another group was going out fishing. We opted to experience Pelican Eyes’ own yacht, taking a sailing trip up the coast to see the empty beaches from the water. During the right times of year you may be able to see sea turtles, porpoises, or whales. There’s a nice gift shop on site selling local handicrafts and Pelican Eyes is deeply involved with a local charity foundation that’s been running since 2000. 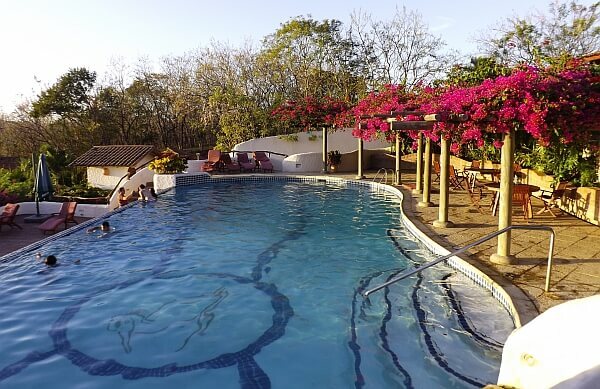 This fine resort has become an institution in San Juan del Sur and while there are other luxury resorts nearby competing for the slowly rising number of upscale tourists, this one is in the best spot for people who don’t want to be isolated in a remote location. Rates start under $200 and you can upgrade without having to go exponential: the largest units rent for under $500. See more at the Pelican Eyes website and you can book rooms online at Preferred Hotels or Trivago. Review by Tim Leffel, who was hosted one night at Pelican Eyes while researching a magazine story on Nicaragua. Photos courtesy of Luxury Latin America – Nicaragua. Looks like a heavenly place for a romantic vacation–especially with that sailing trip in there. I had no idea there were places like this in Nicaragua.